Veer Surendra Sai University of Technology, Sambalpur has advertised in the SAMAJA newspaper for the recruitment of Guest Faculty job vacancies. Interested and eligible job aspirants are requested to walk-in on 29th and 30th June 2018. Check out further more details below. About University: The Veer Surendra Sai University of Technology (VSSUT) Odisha was formed by Orissa Act 9 of 2009 by converting University College of Engineering (UCE), Burla to a non-affiliating Unitary University and came into force by issue of notification by the Industries Department, Government of Odisha from 1st day of July 2009(Vide memo No.IV/TTI-33/2009-8553 and 8564 dtd.10th June 2009. The 1st Statutes of VSSUT, Burla 2010 has been approved by the Odisha Government vide Industry Department notification No.V-FE-II-01/2010/8697 dated 21st June, 2010. Application Fee : Rs.200/- (Rs.100/- in case of SC/ST candidates) in favour of VSSUT, Burla, payable at SBI. Burla,(Code-2034). No TA/DA is admissible for attending the interview. 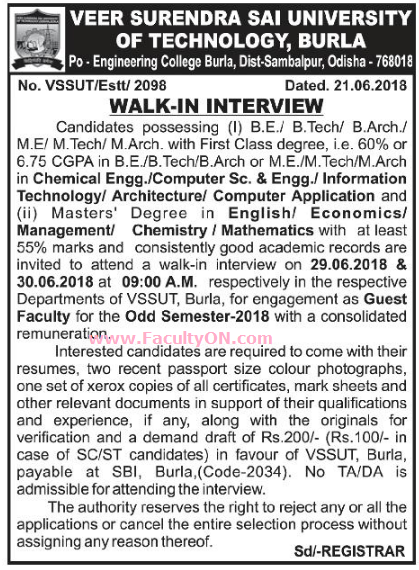 How to Apply: Walk-in interview will be held on 29th and 30th June 2018 at 09:00 am in the respective Departments of VSSUT, Burla. Interested candidates are required to come with their resumes two recent passport size photographs, one set of copies of all certificates, mark sheets and other relevant documents in support of their qualifications and experience, if any, along with the originals for verification and a demand draft.